Synopsis: The product of an experiment in genetic manipulation, superintelligent Leisha Camden is forced to live a life apart from most "ordinary" people and seeks the companionship of other superhumans. By the author of An Alien Light. Review&colon; Many of us wish we could get by with less sleep. 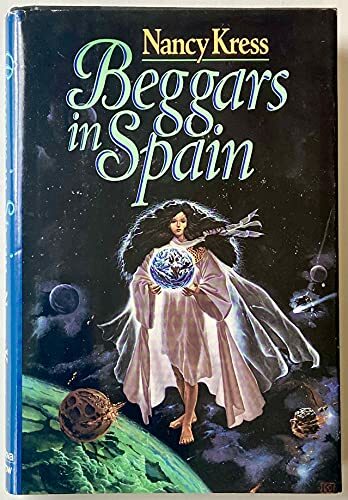 Beggars in Spain extrapolates that wish into a future where some people need no sleep at all. Nancy Kress, an award-winning author of novels, short stories, and columns on writing, has created another thoughtful but dramatic statement on social issues. Leisha Camden was genetically modified at birth to require no sleep, and her normal twin Alice is the control. Problems and envy between the sisters mirror those in the larger world, as society struggles to adjust to a growing pool of people who not only have 30 percent more time to work and study than normal humans, but are also highly intelligent and in perfect health. The Sleepless gradually outgrow their welcome on Earth, and their children escape to an orbiting space station to set up their own society. But Leisha and a few others remain behind, preaching acceptance for all humans, Sleepless and Sleeper alike. With the conspiracy and revenge that unwinds, the world needs a little preaching on tolerance.